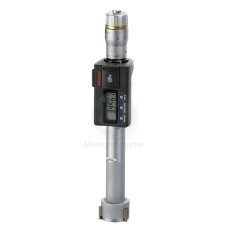 Mitutoyo Digimatic Holtest Bore Gages are on sale at Gaging.com! We are an authorized Mitutoyo dealer. Functions available: Presetting, Zero/ABS, Auto power On/Off, Data hold, Data output, Error alarm, Battery replacement alarm. 468-261 .275 - .35" ±.0001"
468-262 .35 - .425" ±.0001"
468-263 .425 - .5" ±.0001"
468-264 .5 - .65" ±.0001"
468-265 .65 - .8" ±.0001"
468-266 .8 - 1" ±.00015"
468-267 1 - 1.2" ±.00015"
468-268 1.2 - 1.6" ±.00015"
468-269 1.6 - 2" ±.00015"
468-270 2 - 2.5" ±.00015"
468-271 2.5 - 3" ±.00015"
468-272 3 - 3.5" ±.00015"
468-273 3.5 - 4" ±.00015"
468-274 4 - 5" ±.00025"
468-275 5 - 6" ±.00025"
468-276 6 - 7" ±.00025"
468-277 7 - 8" ±.00025"
468-278 8 - 9" ±.00025"
468-279 9 - 10" ±.00025"
468-280 10 - 11" ±.00025"
468-281 11 - 12" ±.00025"
468-261 Mitutoyo Digimatic Holtest 0.275 -0.35"
The 468-261 Mitutoyo Digimatic Holtest 0.275 - 0.35" bore gage is on sale at Gaging.com. We are aut..
468-262 Mitutoyo Digimatic Holtest .35 - .425"
The 468-262 Mitutoyo Digimatic Holtest 0.35"-.425" bore gage is on sale at Gaging.com. We are autho..
468-263 Mitutoyo Digimatic Holtest .425 - .5"
The 468-263 Mitutoyo Digimatic Holtest .425"-.5" bore gage is on sale at Gaging.com. We are authori..
468-264 Mitutoyo Digimatic Holtest .5 - .65"
The 468-264 Mitutoyo Digimatic Holtest .5"-.65" bore gage is on sale at Gaging.com. We are authoriz..
468-265 Mitutoyo Digimatic Holtest .65 - .8"
The 468-265 Mitutoyo Digimatic Holtest .65"-.8" bore gage is on sale at Gaging.com. We are authoriz..
468-266 Mitutoyo Digimatic Holtest .8 - 1"
The 468-266 Mitutoyo Digimatic Holtest .8" - 1" bore gage is on sale at Gaging.com. We are authoriz..
468-267 Mitutoyo Digimatic Holtest 1.0 - 1.2"
The 468-267 Mitutoyo Digimatic Holtest 1.0" - 1.2" bore gage is on sale at Gaging.com. We are autho..
468-268 Mitutoyo Digimatic Holtest 1.2 - 1.6"
The 468-268 Mitutoyo Digimatic Holtest 1.2" - 1.6" bore gage is on sale at Gaging.com. We are autho..
468-269 Mitutoyo Digimatic Holtest 1.6 - 2.0"
The 468-269 Mitutoyo Digimatic Holtest 1.6" - 2.0" bore gage is on sale at Gaging.com. We are autho..
468-270 Mitutoyo Digimatic Holtest 2.0 - 2.5"
The 468-270 Mitutoyo Digimatic Holtest 2.0" - 2.5" bore gage is on sale at Gaging.com. We are autho..
468-271 Mitutoyo Digimatic Holtest 2.5 - 3.0"
The 468-271 Mitutoyo Digimatic Holtest 2.5" - 3.0" bore gage is on sale at Gaging.com. We are autho..
468-272 Mitutoyo Digimatic Holtest 3.0 - 3.5"
The 468-272 Mitutoyo Digimatic Holtest 3.0" - 3.5" bore gage is on sale at Gaging.com. We are autho..
468-273 Mitutoyo Digimatic Holtest 3.5 - 4.0"
The 468-273 Mitutoyo Digimatic Holtest 3.5" - 4.0" bore gage is on sale at Gaging.com. We are autho..
468-274 Mitutoyo Digimatic Holtest 4.0 - 5.0"
The 468-274 Mitutoyo Digimatic Holtest 4.0" - 5.0" bore gage is on sale at Gaging.com. We are autho..
468-275 Mitutoyo Digimatic Holtest 5.0 - 6.0"
The 468-275 Mitutoyo Digimatic Holtest 5.0" - 6.0" bore gage is on sale at Gaging.com. We are autho..
468-276 Mitutoyo Digimatic Holtest 6.0 - 7.0"
The 468-276 Mitutoyo Digimatic Holtest 6.0" - 7.0" bore gage is on sale at Gaging.com. We are autho..